I wish to be drawn on one bended knee holding a diamond ring proposing to my girlfriend. Background: Disney castle with disney characters cheering (please include Chip & Dale) and fireworks(night)"
Colour marker can't do a good job in drawing fireworks. I have used pastel pencils to create it. Not ideal too. Thus, we scrapped this idea. Gave them a starry night instead. This baggy jeans and posture looks quite quite and good for her, I think. 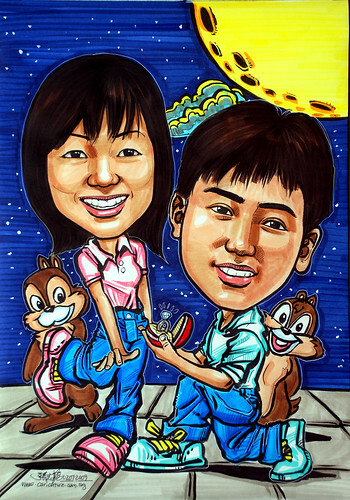 Something different from my usual drawing for 'proposing caricatures'.